Minnie the Moocher (1932) is a Betty Boop cartoon produced by Fleischer Studios and released by Paramount Pictures. 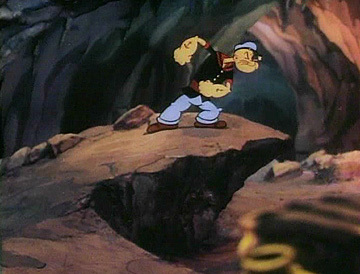 The cartoon opens with a live action sequence of Cab Calloway and his orchestra performing an instrumental rendition of "St. James Infirmary". Then Betty Boop gets into a fight with her strict, Yiddish speaking, Jewish parents, runs away from home with her boyfriend Bimbo, and sings excerpts of the Harry Von Tilzer song "They Always Pick on Me" (1911) and the song "Mean to Me" (1929). The classic tale of Sinbad the Sailor, adapted for Popeye and Olive. Featuring memorable appearances by Wimpy, Olive, and the singing two-headed monster. You can find more information regarding this film on its IMDb page. More information is available from the Wikipedia article here.